Cedar apple rust is one of several fungal diseases that can be classified as Juniper-Rosaceous rusts. The fungus is unique because it spends part of its life on a juniper species and part on a rose species, requiring both plant hosts to complete its life cycle. Apple, pear, quince, crabapple and hawthorn are some of the rose species that can host cedar apple rust. Organic treatment for cedar apple rust include using organic fungicides, purchasing resistant plant varieties and employing healthy cultural practices. In “Texas Gardening the Natural Way,” Howard Garrett recommends using cornmeal products and potassium bicarbonate sprays to control cedar apple rust. Horticultural cornmeal is a powerful fungal disease fighter. Spread it beneath and around susceptible plants at the rate of 150 pounds per acre to help control fungal spores that live in dead plant material and in the soil. Mix four teaspoons of potassium bicarbonate in one gallon of water, and spray plants infected with cedar apple rust. Baking soda (which contains sodium and bicarbonate) is also an effective fungicide, but potassium bicarbonate is better for the soil. Bordeaux mixture, a fungicide and insecticide usually made from copper sulfate and lime, is also used to treat fungal diseases. However, Bordeaux mixture can stain wood and concrete surfaces, so exercise care when spraying plants. West Virginia University notes that the most effective means of preventing cedar apple rust is to plant resistant varieties of susceptible plants. 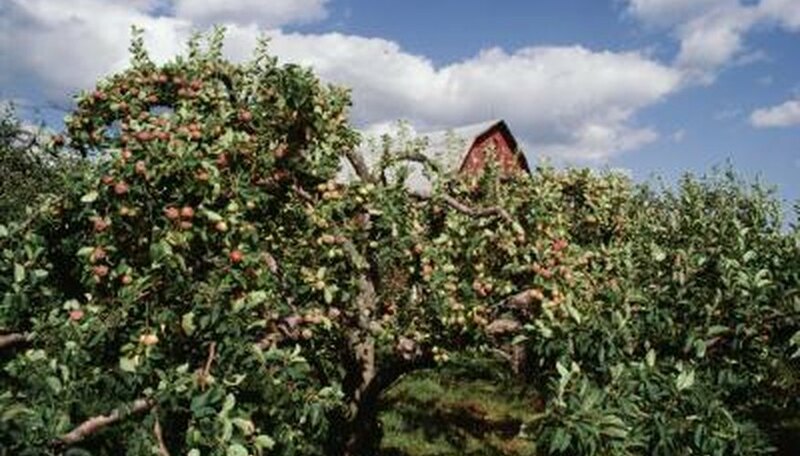 Check with your cooperative extension office to identify resistant varieties of apple, pear, crabapple, quince and hawthorn that are suitable for your area. Another potential practice to eliminate cedar apple rust is to remove all juniper species from your planting area. But spores can travel several miles by wind, so if your area is home to several juniper species, removal from your location only may not be an effective control. Cedar apple rust winters in diseased leaves that are left on the ground. Plants are susceptible to fungal diseases when foliage is wet or during periods of rain when diseases are spread by the spattering effect of raindrops. According to West Virginia University, primary infection occurs when fungal spores drift to green, damp leaves and moist fruit. When lesions erupt, they release new spores that cause secondary infections, continuing the cycle. Exercise good cultural practices around susceptible plants to prevent cedar apple rust, including raking and removing leaves surrounding potential host plants in the winter. Also, keep trees and bushes pruned to allow sunlight to filter through the canopy to all foliage early in the day, providing a drying effect that will reduce the spore’s ability to find a suitable growth location. Texas Gardening the Natural Way: Howard Garrett; 2004.